Bandi and I are two very different people. He knows nothing about art and he can’t even draw heart shape correctly while I love exploring museums. I read books and he read comic books (that’s the closest we can get). I’m all about feeling and impulsive actions while he’s logical and straight forward. I love to dance (though I’m not very good at it) while he’s just starting to do it just so he can spend time with me. He could count without calculator while I don’t remember when was the last time I did that. The first movie we watched together was Shaggy Dog. Because I love dogs. Anyway, today is Monday, and we always have our movie night on Monday now. 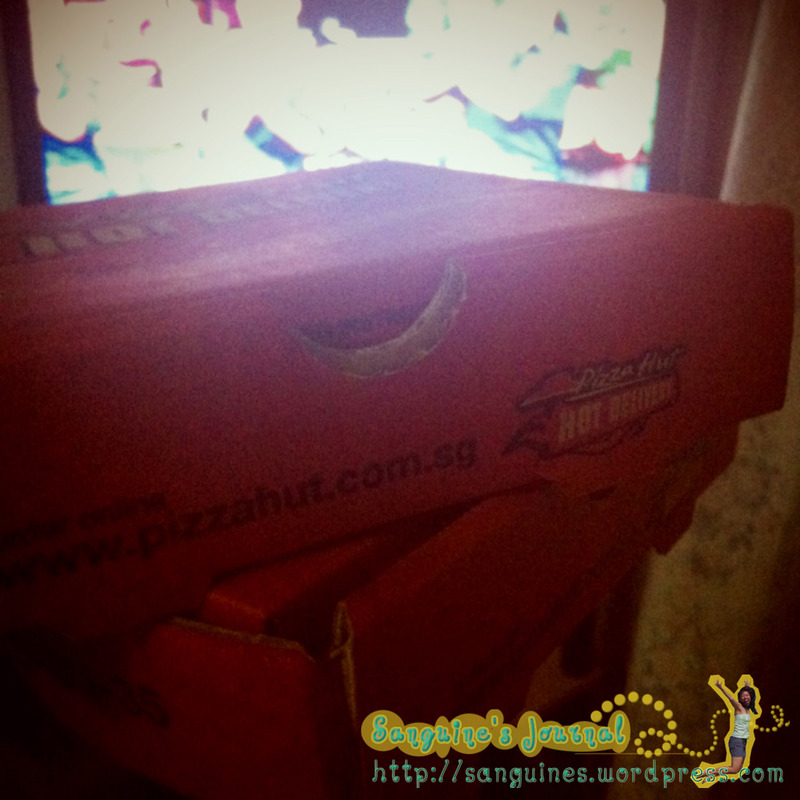 Last time we always did it on Thursday but since Pizza Hut gives the best offer on Monday, it switches to Monday. Yes, there will be no movie night without food!!! 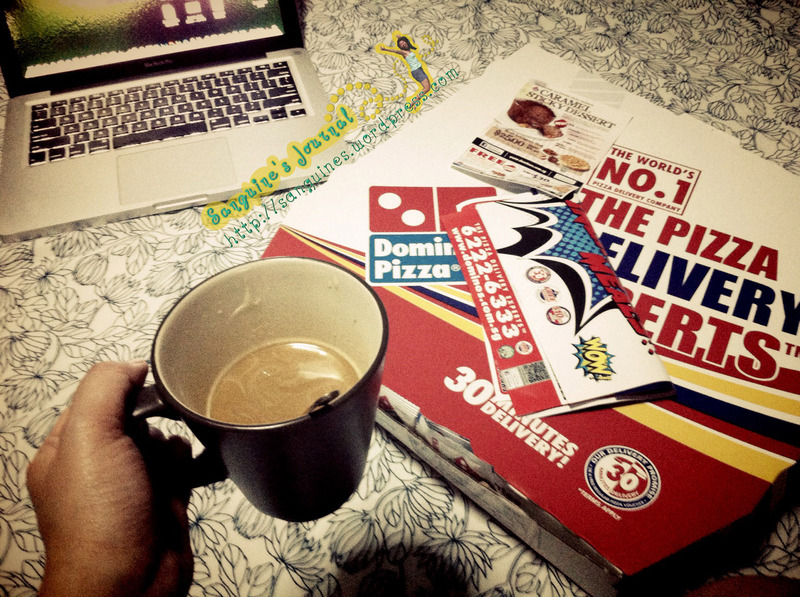 Dominos and a cup of coffee and “Gone” movie. Some of the food choices don’t even make sense, but what the heck. 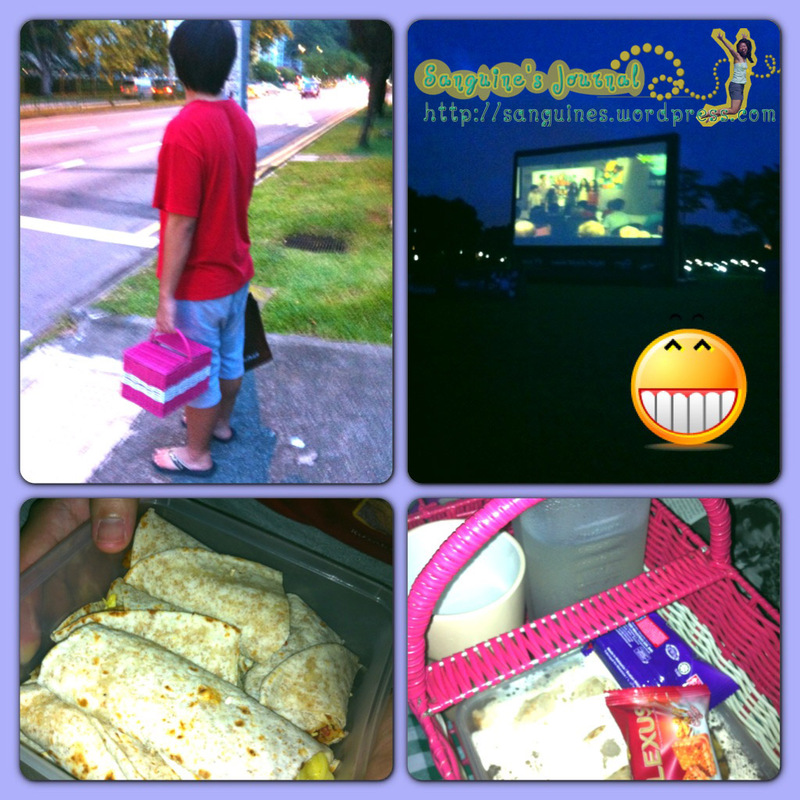 We also went to picnic movie night to Bishan park just 10 mins from home that screened the movie on a very big screen. 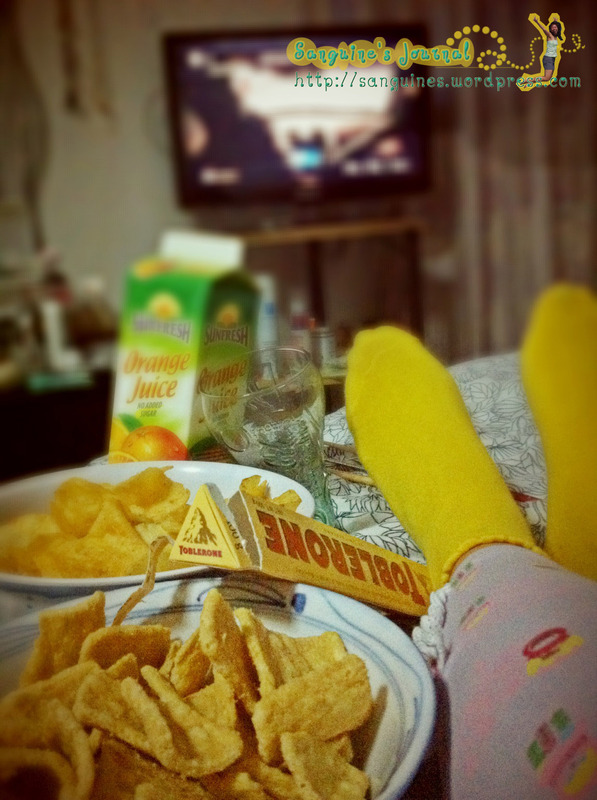 Chips, Chocolate and Orange Juice for “The Intouchables”, a great French Movie. The Intouchables is surprisingly a very good movie. It’s a French drama-comedy movie about a quadriplegic rich man whose life is changed by a black poor guy. And the best part is… it’s based on true story. This is a MUST-SEE movie! This entry was posted in Loving hard, The Sanguinism of the Journal. Bookmark the permalink. Damn girl, you’ve got me craving for some pizza right now, haha. My husband is a big gamer and I play no video game. We both love museums but since the kiddo’s born, it’s been quite a feat trying to squeeze in a museum date. When we have time together for just the two of us after the kiddo’s in bed, we’re usually way too tired to dress up and head out on a proper date, you know, dinner and the movie theater and all that jazz. so it’s almost always movie night for us too. Sweatpants,food, couch.. I mean, what’s better than that, amirite? hahaha. Will check out Intouchables, thanks for the rec! And in the end we’re gonna put our pjs on and watch tv the whole saturday. Anyway, waktu lo bilang monday is your movie night, gw pikir tiap monday kalian ke bioskop. I remember, kalo di singapore ada diskon kalo nonton hari tertentu, tp monday bukan ya? Anyway, the further I read, I realize, maksudnya movie nightnya bisa dimana aja toh… Menarik!! Yah intinya mah movie night haraus gratiiissss! hahahaha. Though I adhere to the wisdom “vive la petite difference”( long live the little difference) is crucial in any relationship, I’m convinced lasting exciting couples differ a lot from each other, fight a lot, leave each other a lot of breathing space but stand by each other no matter what and have same lifestyle preferences. Bishan Park!! I was just there last Sunday…. just for the second time ever in my 14-years of living in Singapore.. hahahaha… Park nya bagusss yah.